Females account for only 28 per cent of the national manufacturing workforce — and far less on the Prairies. The manufacturing industry needs more people like Tammy Wisminity. For the past three years, the 41-year-old single mother has operated a universal grinder at Standard Machine in Saskatoon, putting the final touches on extra-large wheel bearings for mining equipment and large industrial trucks. After a decade-long career as a farmhand, she was already accustomed to shedding career stereotypes. Manufacturing, however, has budded into her true calling. And she believes if more women knew about the immense opportunity in the sector, more would be likely to join her in the workforce. That has been the rallying cry for manufacturing leaders across the country, who are now fully engaged in a coast-to-coast initiative to increase female participation in ‘non-traditional’ occupations. The transition being catalyzed by automation and Industry 4.0 technologies will bring with it a burgeoning demand on new skills and greater diversity. This becomes doubly important when considering the growth in the working-age population is expected to level off at zero per cent in Canada by 2020. And what better place find a new supply of talent than in a demographic historically underrepresented: Women. This past fall, Canadian Manufacturers & Exporters (CME), in partnership with BDC and KPMG, made its marquis effort to catapult the issue to the national forefront, releasing Untapped Potential: Attracting and Engaging Women in Canadian Manufacturing — a research-laden report culminating in an action plan designed to encourage women to pursue careers in manufacturing. Women like Wisminity, productively engaged on the shop floor — and embracing the role — would like nothing more than to have a greater number of women working by their sides. They see no reason why that can’t be the case, either. But the fact remains that women still account for only 28 per cent of the manufacturing workforce, and there has been no marked increase in that share over the past 15 years. Only six per cent of employed women in Canada have a job in manufacturing, compared to 13 per cent of men. Most agree it won’t be easy to change that dynamic; though, it is a good sign that real attention and resources are now being directed toward making and sustaining progress. Patience will also be key. Among the industry’s priorities is reclaiming the image of modern manufacturing. It’s no longer about dingy and dark factories, or heavy lifting; manufacturing today can offer some of the most attractive work environments available, regardless of if you are a machinist or marketing major. The message is simply not reaching the masses as well or as widely as it should be. It was noted in the CME report that, while women’s participation in the workforce at-large has increased over the past three decades, shifting economy-wide dynamics are changing the manufacturing landscape. For example, women have traditionally accounted for the highest percentage of jobs in certain manufacturing sub-sectors, such as garment production, at 62 per cent. Yet, now, that business has all but moved offshore, taking the volume of jobs with it. In specialized, high-skilled areas and STEM-related positions, women are as hard to find as ever, accounting for less than 4.5 per cent of employment in the skilled trades, 7.2 per cent of manufacturing jobs in supervisory and central control operations, and 8.3 per cent in transportation and heavy machinery operation. The Prairie provinces are particularly weak when it comes to gender representation, lagging well below the national average. Saskatchewan has the dubious distinction of bearing the lowest rate of women in manufacturing, at only 19 per cent, although it’s not due to a lack of effort. 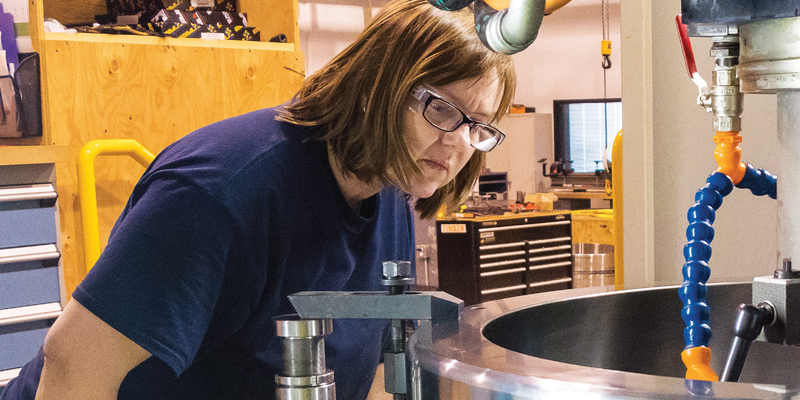 At Standard Machine, where employees work on gearing as large as 30 feet in diameter, Organizational Advancement Manager Jodi Lant maintains physical limitations are not as prevalent as a lack of female applicants. Another of the highlighted areas for CME’s action plan is related to profiling role models and providing a heightened degree of industry exposure. It may force manufacturers to address their longstanding reluctance to throw their doors open to the public. Carolyn Geddert, who heads up the University of Manitoba engineering co-op program, believes that manufacturing has not enjoyed the benefits of its public promotion efforts to-date — in part, because those efforts have been minimal (or, at least, uncoordinated) to begin with. After all, it’s not like there are picture windows where passers-by can watch a bus being assembled or a circuit board being printed. As far as the co-op program is concerned, Geddert believes there would be an uptick in both company participation and disposition from female students if that narrative changed. The problem is that the women who have chosen manufacturing as their career path already are generally happy with where they are working. The authors of Untapped Potential assert one of the most important findings was that 83 per cent of women under 35 years old working in manufacturing are satisfied with their career choice and would recommend it to others. In fact, within this metric, women are actually more satisfied than their male counterparts. Tricia Girardin would fall into that category. She notes there are more women in the business now than when she started, but moving the needle further will require a coordinated focus that has been absent in the past. Part of that needs to be encouraging employers to truly listen to the concerns of women, and then take steps to make their workplace culture more inclusive — the final pillar of the CME report. CME, however, is not alone in its pursuits. Engineers Canada, the national organization of provincial regulatory bodies that license engineers, is also working to increase the number of women in their ranks, with the goal of raising the percentage of newly licensed engineers who are women from 17 per cent to 30 per cent by the year 2030. Back in Saskatoon, Jodi Lant is equally optimistic and cautious. While she insists headway will not be made overnight, Lant is adamant the industry must start by peeling away the Prairie humility and talking proudly about its opportunity and accomplishments — especially where women are at the centre of the storyline.